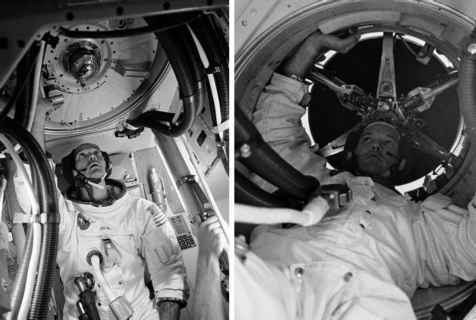 Soon after the centre engine had shut down as planned on Apollo 16, and as they approached the final minute of the S-II's flight, the crew felt a slight, but expected drop in thrust. ''PU shift,'' called out John Young, the mission's commander. ''Sixteen, Houston. We saw the PU shift. Thrust looks good, and you're Go for staging,'' replied Gordon Fullerton, the launch Capcom. What was shifting was a valve in each engine that controlled the flow of LOX to the combustion chamber. This was the propellant utilisation valve and it was one of the strategies brought into play to ensure that the propellants were utilised as fully as possible. These strategies were implemented by the engineers at North American as they struggled to squeeze as much impulse out of the stage as possible in the light of the narrowing weight limits to which they were constrained. If a substantial quantity of either LH2 or LOX remained in the tanks after shutdown, it was useless weight that had not only failed to contribute to the task required of that stage, but had also consumed useful propellant by being lifted and accelerated to space. Engineers were keen to balance the consumption of the two propellants in order to minimise the quantities remaining in the tanks at shutdown. However, small errors in the quantity of propellant loaded before the flight, and an imprecise knowledge of how fast the engines would consume it, made it difficult to plan for matched consumption. The method chosen to minimise wastage was to monitor the levels in the tanks and change the mixture ratio at a point that would lead to simultaneous depletion. The normal mixture ratio of LOX to LH2 in the J-2 engine was 5.5 to 1. Every kilogram of hydrogen was burned with 5% kilograms of LOX. While the engines burned at this mixture ratio, sensors in the tanks determined how quickly the level of each of the propellants was falling. From this information, the computer in the instrument unit decided when to change the ratio to a richer mixture of between 4.5 and 4.8 to l. If the timing was correct, the two tanks could be made to empty almost simultaneously. The shift in mixture ratio occurred on every flight of the S-II, though not all the crews noticed the change like Young had. Twenty-five seconds later, another call came from mission control. This cryptic call was related to another strategy to ensure that the stage's propellant was fully utilised. The S-II was a high-energy stage and its designers wanted it to burn for as long as possible with the propellant it had available. In its role for the Apollo lunar flights, when it took the stack to about 90 per cent of orbital speed, it did not have to shut down at a precise speed. Doing so would always hold the possibility that large quantities of wasted propellant would be left on board. Its job was to add as much speed as its propellant could deliver. The final increment of speed would be supplied by the restartable S-IVB engine. It was therefore important that shutdown occurred when the tanks were as empty as possible and, for this, designers used the falling propellant levels to initiate shutdown of the stage. The two propellant tanks each contained five sensors that would indicate that the stage was nearing exhaustion. As soon as two sensors within either one of the tanks indicated depletion, the engine cut-off signal was sent, shutting the stage down. Engineers had feared that these sensors might send a false shutdown command so they arranged for this system not to be armed until a separate gauging system had verified that the tanks were indeed nearing depletion. This was the point where the 'level sense' system was 'armed'.